PG&E’s supplier diversity program shines through as a cornerstone of our commitment to build a better California. For more than three decades, we’ve worked to integrate diverse suppliers and small businesses into our business. The benefits are of doing so are clear: a diverse supplier base not only helps us provide safe, reliable and affordable gas and electric service, it also supports economic development, drives job creation and strengthens local communities. Within the energy industry, PG&E has one of the leading programs for bringing diverse business enterprises (DBE)—companies owned by women, minorities, service-disabled veterans and LGBT individuals—into our supply chain with annual goals that drive our sustained commitment. To broaden our efforts, we actively work to strengthen the competitive profile of small and diverse businesses through business workshops and capacity-building training that support safe, cyber-secure, green and thriving suppliers. Doing so reflects and celebrates our diversity, increases economic vitality in our communities and improves the quality and cost-effectiveness of our supply chain. Internally, we promote supplier diversity through a broad network of Supplier Diversity Champions, a group of employees responsible for expanding supplier diversity within our lines of business. Through regular meetings with senior leadership, these employees set diversity goals, develop strategies, share best practices and monitor progress toward continuous improvement of our supplier diversity results. We also recognize leadership; employees who make the largest impact are honored at PG&E’s annual Supplier Diversity and Sustainability Achievement Awards event. Our Supplier Development Program engages PG&E executives to mentor incumbent diverse suppliers and, with cross-functional team support, identify opportunities for those selected diverse suppliers to grow. PG&E also actively engages with community-based organizations at the local, state and national levels to promote supplier diversity, spur innovation and support the competitiveness of diverse suppliers. Last year, PG&E participated in more than 100 outreach events to meet and promote diverse suppliers, introduce prime suppliers to the diverse business community and learn and share best practices with peer companies. When INTREN, Inc., a woman-owned business, started providing PG&E with underground and electrical overhead work in 2011, it had a local employee base of 15 people. PG&E’s initial spend with INTREN was under $1 million. Four years later, the supplier has nearly 90 local employees working out of two San Francisco Bay Area offices, and PG&E’s spend has risen to more than $30 million. In 2014, INTREN, Inc. was honored as both PG&E Supplier of the Year and Electric Operations Supplier of the Year. PG&E partners with organizations in the private and public sector to advance supplier diversity, innovation and competition, particularly at the small business level. In 2014, PG&E partnered with the U.S. Small Business Administration (SBA) to organize a series of capacity-building workshops and training seminars throughout Northern and Central California. SBA is the only federal agency dedicated to providing loans, loan guarantees, contracts, counseling sessions and other forms of assistance to small businesses. PG&E encourages prime suppliers to subcontract with diverse suppliers and develop measurable and sustainable supplier diversity programs of their own. Prime suppliers are asked to set diverse subcontracting goals, track performance through monthly reports and participate in business matchmaking and other outreach events to meet prospective diverse suppliers. PG&E offers a wide variety of technical assistance and training programs to suppliers, many in conjunction with community organizations. These initiatives help diverse suppliers build their business acumen, and include scholarship opportunities from the UCLA Management Development for Entrepreneurs Program and the University of Washington Minority Business Executive Program. PG&E is also focused on supporting the growth of mature diverse suppliers into new technology by sponsoring their participation in the University of California Advanced Technology Management Institute. This executive training initiative helps diverse firms identify business strategies to take advantage of emerging technology opportunities. Diverse Suppliers are Safe educates diverse suppliers on the importance of developing and improving their company safety plans. Diverse Suppliers Go Green instructs participants on how to establish a sustainability program, reduce their environmental footprint and identify green business opportunities. Diverse Suppliers Go Global offers information and shares resources on how to evaluate and participate in the global marketplace. Diverse Suppliers are Cyber-Secure, new in 2014, raises cyber-security awareness and offers approaches that a small business can take to cost-effectively assess its vulnerability and reduce risk. In 2014, we spent $2.1 billion with diverse suppliers—or 40.9 percent of our total procurement spend—exceeding our goal of 40 percent. In addition, PG&E surpassed the California Public Utilities Commission’s diverse spending goal of 21.5 percent for the ninth consecutive year. This is the third consecutive year PG&E’s diverse spend has surpassed the $2 billion mark. Moreover, this was achieved as PG&E’s overall procurement in 2014 decreased by $343 million, or 6.2 percent, due to the completion of major projects. Further embedded supplier diversity within our core business. For example, the Power Generation department organized a supplier diversity business matchmaking session, mentored diverse suppliers to improve their capability on larger projects and implemented a requirement to conduct a supplier diversity webinar for any parties submitting Requests for Proposals greater than $500,000. As a result, the department exceeded its 2014 goal. Supported President Obama’s SupplierPay Program. Pacific Gas and Electric Company was the first utility and one of the initial 26 companies to participate in President Obama’s SupplierPay Pledge, which encourages large corporations to develop ways to help small business suppliers address financial challenges. 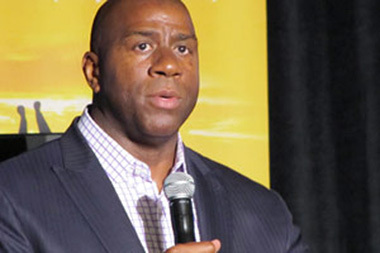 Expanded our Supplier Diversity Ambassador Program. An additional 35 employees signed up to represent PG&E in the community by becoming Supplier Diversity Outreach Ambassadors in 2014, growing the volunteer list to nearly 200 members. Through the efforts of Outreach Ambassadors, many of whom are buyers, PG&E was able to extend its outreach to thousands of prospective diverse suppliers that came to business matchmaking sessions, visited PG&E booths or attended diverse business conferences and trade shows. Put boots on the ground. Held in partnership with the SBA, the California Department of General Services and the San Francisco Minority Business Development Agency Business Center, the second annual “Boots to Business” SBA program introduced transitioning military service members to the fundamentals of small business ownership and available tools and resources. More than 90 veterans attended the workshop at PG&E’s corporate headquarters in San Francisco. 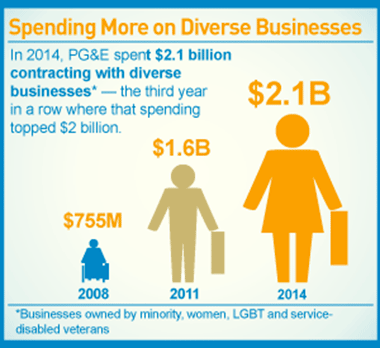 PG&E’s spending with diverse businesses has grown substantially over the past 10 years. In the past five years alone, PG&E nearly doubled its annual spend with diverse businesses; in the past decade, diverse spending has increased by 488 percent, or more than $1.7 billion. PG&E’s growth in diverse business procurement demonstrates our long-term commitment and has earned PG&E recognition. A partial list of honors includes being named to the “2014 Million Dollar Club” by the U.S. Hispanic Chamber of Commerce for spending with Hispanic-owned businesses in 2013 and recognition from the Women’s Business Enterprise National Council as one of “America’s Top Corporations for Women Businesses Enterprises”. PG&E strives to improve its industry-leading supplier diversity program by enhancing existing and developing new initiatives to support the continued success and growth of diverse businesses and local communities. Supporting the development of diverse suppliers in areas of PG&E’s growth such as gas pipeline safety, energy procurement and new technology through technical assistance and capacity-building initiatives. Enhancing our Prime Supplier Program through additional training and communication on diverse subcontracting, partnering and mentoring. Supporting executive training initiatives that encourage mature diverse suppliers to consider competing for opportunities in emerging technology. Providing quality and environmental systems certification scholarships to help diverse suppliers build the necessary business practices for successful, scalable growth.